The first day of Fall 2017 wasn’t chilly and making me want to wrap myself in a new sweater. Do you remember? Last year, we set a new record high temperature. I vividly recall those blistering temps because I work in a school that does NOT have air conditioning in the classrooms. I was less than enthusiastic about coming in that day. I survived by drinking plenty of water and standing in front of fans any chance I had, but I did my share of complaining. There are many fall activities that you can enjoy with your furry friend. Dogtime.com found a list of seven easy ones for your consideration. Like any other season, Fall can bring some health and well-being dangers for your pet. Common sense should always prevail but just in case here are some basic reminders of how to keep your furry friend safe. To all the fall-loving dog owners: Enjoy this time of year! Thanks for reading and please “leaf” a comment telling us how your dog celebrates fall! Man who lost limbs due to bacteria in dog’s saliva says he ‘couldn’t wait’ to see his dog Ellie. Wisconsinites are lending a helping hand to Hurricane Florence victims. Ontario researchers use 3D-printing tech to replace dog’s cancer-ridden skull. Meet Molly, the world’s first anti-doping dog. I feed my dog treats through a camera while I’m at work — here’s how. Are Dog Booties Actually Necessary? National Dog Week: Google’s Most Searched Dog Questions. Petfest 2018 was held last Saturday at Henry Maier Festival park. The festival invited guests to bring their dogs, cats, and even rabbits for a variety of fun activities. 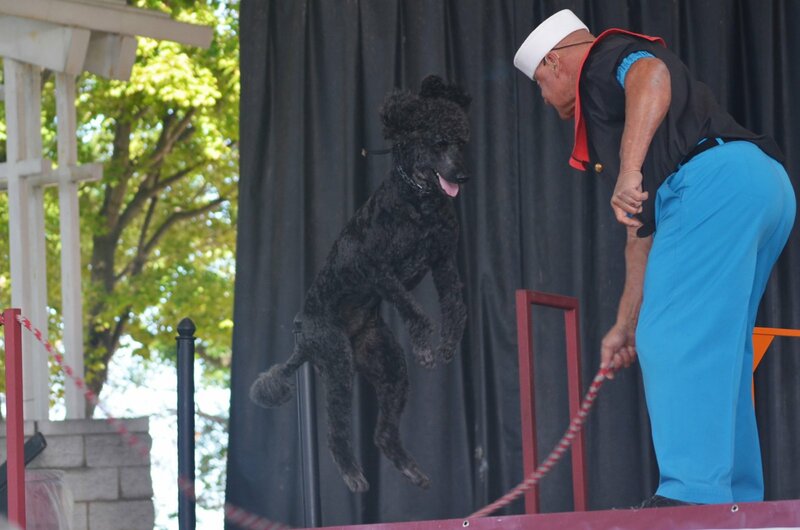 Six time Guinness World Record holder Sailor the Poodle was there with his handler Alex “Popeye” Rothacker. Photo: Jack Fennimore for UrbanMilwaukee.com. Let’s bring in the author to answer a good question. And one more: A Dog’s Dream. Watch.